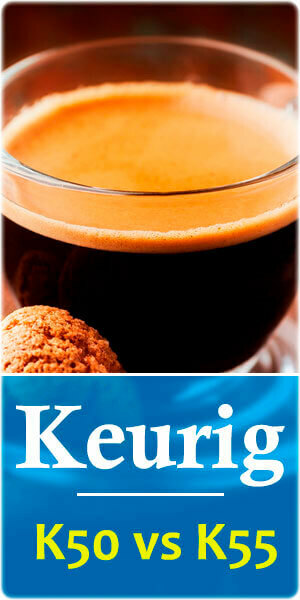 Wondering what’s the difference between the Keurig K50 and K55? Are these two coffee makers the same? We did quick reviews so you’re informed when trying to find the best buy between the two. For starters: In general, the K55 model series has more functions and capabilities than the K50 with a key difference being the K55 model has a water filter. The K55 model has a timer in contrast to the other model so you’re able to control the total time it takes to brew your coffee. This will help you vary the flavor levels of the coffee and reduce its bitterness & acidity according to taste. The K50 model also has unique features of its own for instance it comes with six variants of coffee to start your brewing experience. Want to know more? Let’s start with a side by side analysis of Keurig K50 vs K55 with the aid of the comparison chart below. Both the K50 and K55 have large water reservoirs, 48oz in size and removable for your convenience when filling up. The auto off feature means the coffee maker is programmed to deactivate itself after lying idle for about two hours. If you’re looking for energy saver this feature will impress. Multiple K cup sizes which are 6, 8 and 10oz. These are the most popular pod brew sizes for any standard coffee maker. The both have button controls. Drip trays which are removable and easy to clean. Though there are similarities the K50 comes with the following unique features. It brews over 500 different K Cup pod varieties from 75 brands including Starbucks and Lipton, it can brew quality coffee, tea, hot cocoa and iced beverages easily. Also, it accommodates a travel mug up to seven inches tall. All you need to do is remove the water trap and set your cup. However, it will only produce a maximum of 10oz coffee at a time. It keeps the water hot. You can use both pods and cups with this coffee maker. It has a yellow refill light which flashes when the water needs refilling. The K50 has fairly compact dimensions. The drip tray plate is made of plastic. 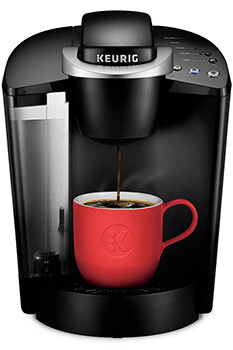 The K55 has is a single-serve coffee maker. The classic series K55 which refers to the entire retail package deals & the new gift box plus all items packed in the box. It comes with a universal reusable filter which is simple and convenient. This is the only filter approved for use in Keurig K cup coffee makers. Also, It automatically heats up when the heat light is on. Related: What’s the Difference between Keurig K475 and K575? Descaling capabilities which are important for cleaning the coffee maker. Obviously, after taking the above into consideration the K55 series has more capabilities than the K50. You’ll need one lithium-ion battery to operate either of the two coffee makers. This is purchased separately by owners. Now that we’ve covered various aspects of these two coffee machines let’s have a look at the advantages and disadvantages they come with. You’re able to brew coffee, tea and iced drinks. It’s generally a quiet Keurig. It’s the cheapest of the two models. Brews coffee in under a minute. It takes longer to brew a cup of coffee with the K50 than with the K55. The reliability of the K50 is questionable. Coffee brewed in a K50 has a terrible plastic taste vs the K55. The K50 can get clogged after some time although you can purchase a tool from Keurig to unclog it. No display screen makes it difficult to reprogram every morning to make a cup of coffee. Neither has temperature controls so you’re unable to adjust or control the temperature yourself. You’re unable to empty all the water from the machines and as a result mould can develop. This can become a health hazard. The K55 model’s major disadvantage is it unfortunately has no strength control compared to its K50 counterpart. With that said the K55 offers more benefits in terms of cup compatibility and has generally more enhanced & innovative features. Now let’s look at some pros and cons to give you a quick summary of the most important facts. Easy to make multiple cups of coffee. Brews only up to 10 ounces. Doesn’t work well with reusable filter. Easy to program & operate. Doesn’t fill the cup all the way. We can’t compare products without talking about performance. Does it then imply these modifications make the K55 a better performer vs the K50? The K55 has better functionality which makes it possible to prepare a cup of coffee in just under a minute. The same can’t be said about the K50 as it takes an extra 30 seconds to achieve the same result. The K55 is more durable and reliable than its K50 counterpart. The K55 comes with different cup sizes so you can select the size of cup you want. The K50 comes with a standard size cup. The K55 comes with a descaling feature that removes calcium deposits that build up over time inside the coffee machine. This feature isn’t present in the K50. It’s reasonably sized and fits just about any kitchen, even small ones. The K50 coffee maker is compatible with all Keurig K Cup pods and you can use pods from other brands like Walmart & still get the same result. You can use the special filter provided or you can purchase your own grind. Taste has to be one of the most important aspects you consider before deciding to purchase a coffee maker. You’ll want to know if the use of either machine will alter the final taste of your coffee. Generally, you’re guaranteed the best taste from the first six ounces of coffee you make from both the K55 and K50 after which the strength starts to decrease. TIP: You can use the 6oz size to achieve the strongest brew! To some extent the K55 brews stronger coffee but the difference is minimal. However, it has been reported after some time of using the K50, the coffee suddenly develops an unpleasant taste, something reminiscent of burnt rubber or plastic. This chemical taste is, unfortunately, accompanied by an odor too. The K50 model also doesn’t work well with a reusable filter and it makes a mess during brewing. You waste water and filters which isn’t environmentally friendly. How does the K55 model fare with regards to the taste of coffee? It has two water filters which ultimately make the coffee taste better than when the K50 is used. You can use filtered or bottled water if you want an even better tasting cup with the K55 coffee machine. TIP: Never use softened water because sodium ions present in that water form a gelatinous mass around the coffee grounds & tea leaves. This causes over extraction and can also clog the brewer. If you use your own coffee grind. The initial flow from the k cup contains a higher concentration but it drops over the entire cycle time and becomes watery. Now that we’ve noted some differences in terms of both their performance let’s look at cleaning the machines. If you only use the machine to make coffee cleaning it once a month will suffice. If you use it for tea, run clear water through the machine each time before brewing your next cup. If you use it for hot chocolate clean the machine thoroughly and never let the machine set without cleaning. However, with regards to the K55, you can also use undiluted or distilled white vinegar to descale it. After the above considerations it’s safe to conclude that even though they’re both similar in design, the K55 offers more capabilities for better performance. After taking the above factors into consideration, of the two models we highly recommend the Keurig K55. It offers more features and flexibility making it a better option than the K50 model. One of the main features that customers are raving about is the K55’s k cup capability which is compatible with all Keurig brands. Its descaling properties are exceptional. Regular cleaning of your coffee brewer machine is necessary for optimum performance and the descaling properties help you do just that. In any review, the K55 also comes highly recommended where durability is concerned because of the K50 breaks often. According to customer reviews, the K50 coffee brewer unexpectedly stops working after a few intense uses. Where the taste of coffee is concerned brewers favor the K55. It takes the lead because the coffee brews are stronger. The coffee brewed in the K50, unfortunately, has a plastic taste according to many reviews. The multiple colors available of the K55 makes it a better selection because it can easily blend in with your kitchen appliances and decor. In a nutshell, the K55 model is a newer model which has more functions making it capable and powerful compared to the K50. 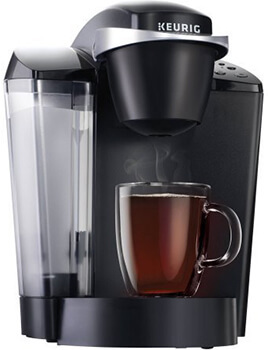 It’s considered the best coffeemaker machine released by Keurig! Will you join this group of enthusiastic supporters too?